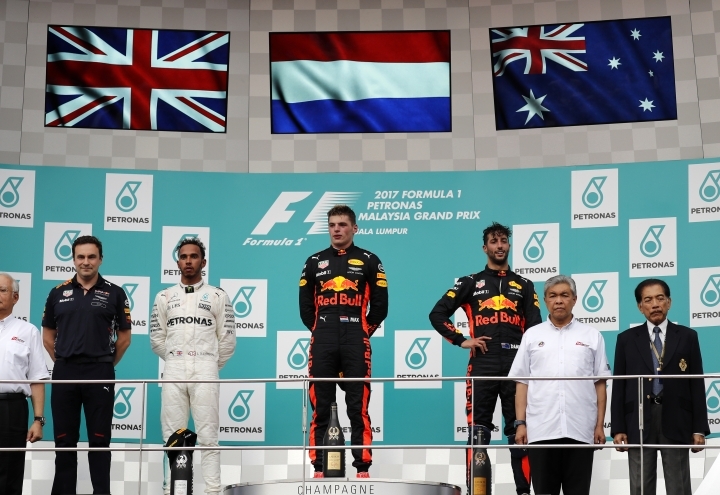 SEPANG, Malaysia — Max Verstappen celebrated his birthday by winning the Malaysian Grand Prix in style on Sunday, while Lewis Hamilton finished second to extend his championship lead over Sebastian Vettel. Vettel started the race from last but drove brilliantly to take fourth place behind Red Bull's Daniel Ricciardo and limit the damage to his own title hopes. Ferrari teammate Kimi Raikkonen did not even start, despite qualifying second. 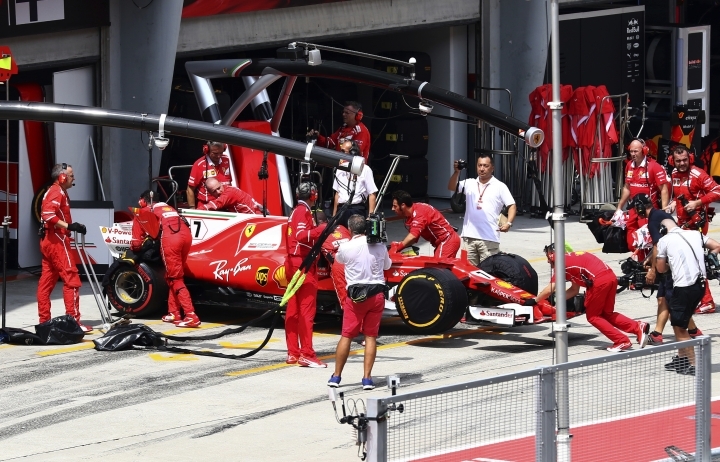 Moments before the race, mechanics wheeled Raikkonen's car back to the garage but could not get it ready. Hamilton secured the 70th pole of his career in qualifying, and his fourth straight in Malaysia, while Vettel failed to set a time because of an engine problem. The day after turning 20, Verstappen turned on the style, making a fine move to overtake Hamilton on lap 4. "The whole race went well. Once I got past Lewis I could focus on my tires," Verstappen said. "From then on, I could race my own race. It's incredible to win." His father, the former F1 driver Jos Verstappen, looked emotional as his son stood on the podium. Dutch fans poured onto the grid to join in the celebrations, with one fan applauding with a pair of clogs. 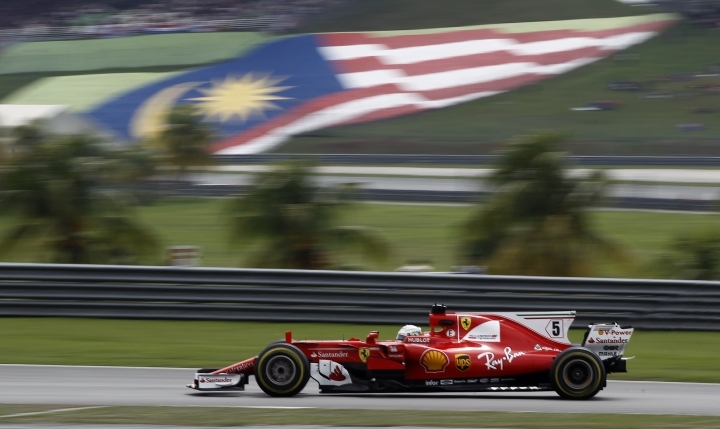 Hamilton's only win in Malaysia was in 2014. He led comfortably last year but retired with an engine failure. Vettel's last win came at the Hungarian GP before the summer break, moving him 14 points clear of Hamilton. But the British driver has won three of four races since and now leads Vettel by 34 points with five races remaining. "It's a step toward trying to win this world championship so every point counts," Hamilton said. "Considering the issues we had with the car, it's a good weekend." Hamilton had failed to finish higher than fifth in practice but found some speed in qualifying. Still, given his position — and where Vettel was — he might have expected to be further ahead. 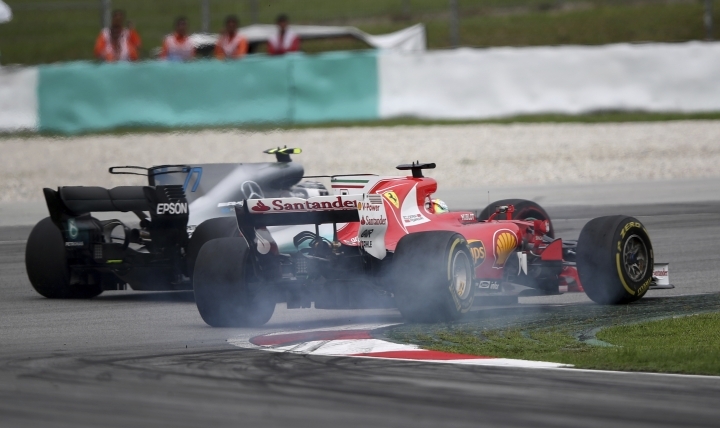 Vettel saved Ferrari's blushes but, as if Ferrari's luck could not get any worse, Williams driver Lance Stroll smashed into the side of his car on the warm-down lap, cutting it almost in half. "That's impossible," a stunned Vettel said. "Stroll's not looking where he's going. He's shunted into my car." Stewards investigated the issue but no action was taken. In a light-hearted moment, the German driver hitched a lift back to the paddock the novel way — by sitting on the side of countryman Pascal Wehrlein's Sauber. 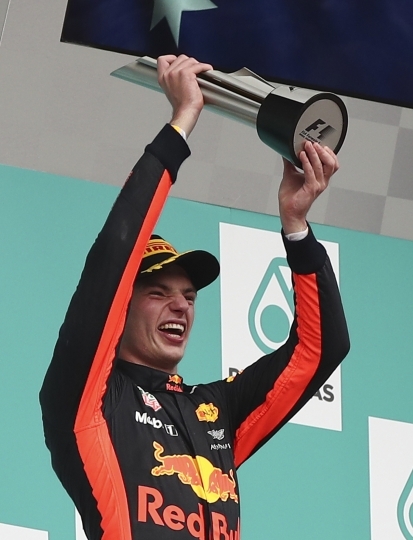 Verstappen won the Spanish GP on his Red Bull debut last year, and became the youngest driver on the front row when he qualified second for Monaco. He was still 18. Up until Sunday, however, his season had been blighted by engine problems. Since placing third at the Chinese GP — the second race this season — he failed to finish seven times. Two weeks ago, he was taken out on Turn 1 by Vettel and had to retire. But his luck held and he delivered a composed performance in keeping with the predictions that he will become a future great. "Big congratulations to Max," Hamilton said. "He did a fantastic job today." Hamilton made a clean start — although with no car next to him on the front row that was hardly difficult. Verstappen drew cheers from the Sepang crowd — watching a race here for the last time — after sweeping past Hamilton, who failed to defend his position aggressively enough. "I opted to go on the inside. 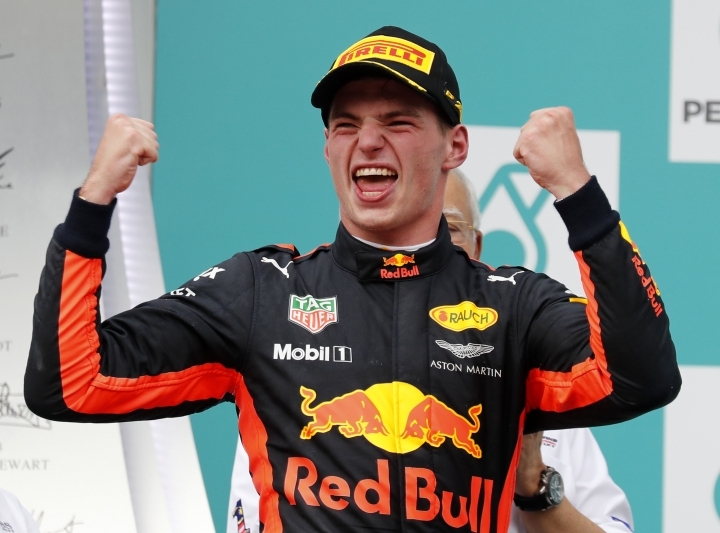 It was my only chance," Verstappen said. "I saw Lewis was struggling more with traction, so I used my battery a bit more." Valtteri Bottas made a great start from fifth to third, overtaking Red Bull's Daniel Ricciardo, but was soon under pressure from the Australian. Since signing a new Mercedes contract for next year, Bottas has hit a poor spell of form and he finished fifth. 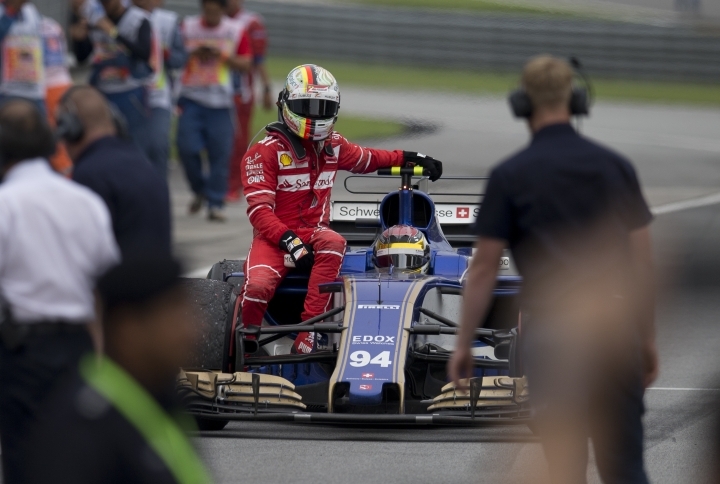 Vettel drove like someone keen to defy the odds. He found just enough room to squeeze inside two-time F1 champion Fernando Alonso on lap 10 — a textbook overtaking move — to move 10th and into the points. At this point, Raikkonen was already in his shorts and walking back to the Ferrari motorhome. Vettel might even have caught Ricciardo, moving to within one second of the Australian driver late on. "Seb came so quick at the end, I felt like I was going to have a handful," Ricciardo said. "But he only had one attack." For Ricciardo it was an eighth podium in 11 races, and another sign that Red Bull is coming back strongly.